How do I watch these videos on my TV? 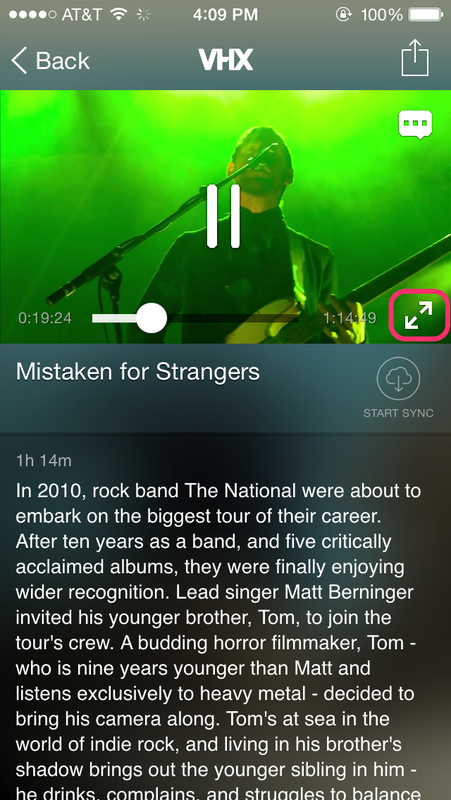 Watch your purchased videos on the VHX iOS App using Airplay. 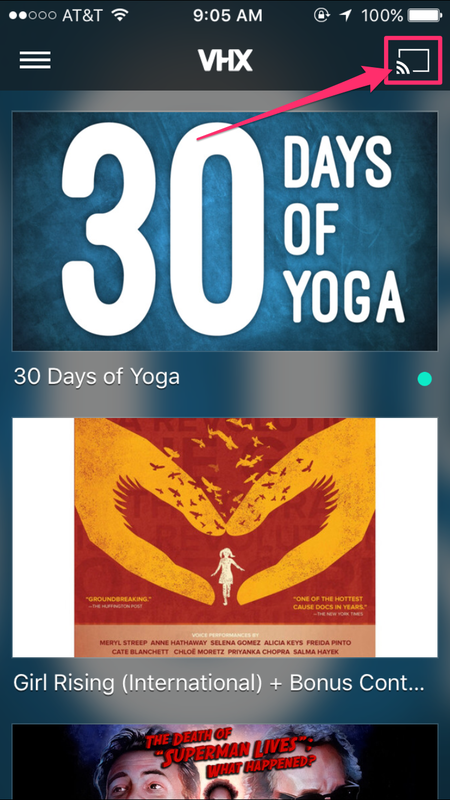 Once logged in to the VHX app and your library has loaded, tap the image of the video you want to watch. The video's package will load, and you can choose a video to begin watching. Stream video right to your Apple TV with Airplay. Simply tap the Airplay icon and select Apple TV. Not all videos on VHX are available for download. If downloads are disabled on a video, watching on a TV via this route will not work. Download the MP4 video files to your computer from the videos watch page. Once the download is complete, you can then drag and drop the file right into iTunes. 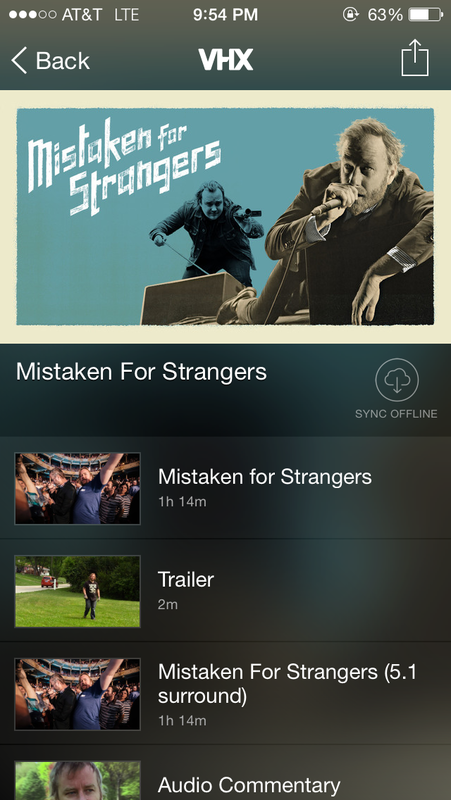 It will appear under the "Home Movies" section of the Movies tab. Locate the file on your Apple TV under Computers, hit play, and enjoy. 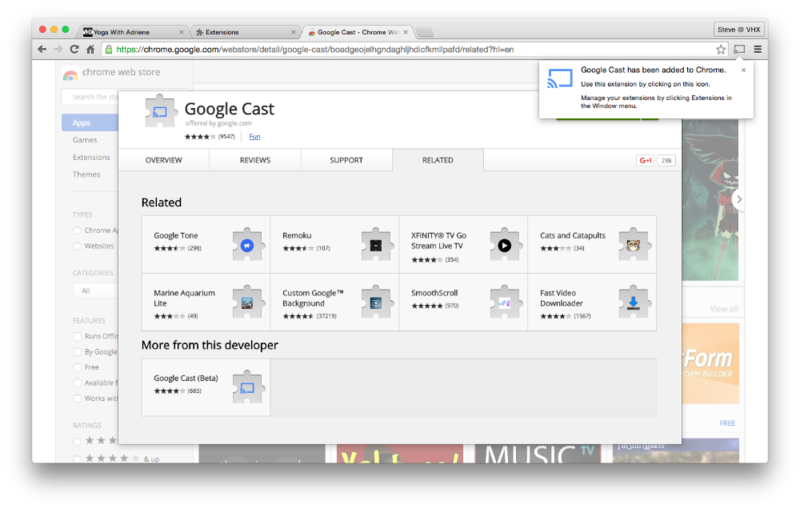 On your computer, using the Chrome browser, download and install the Chromecast Extension here. 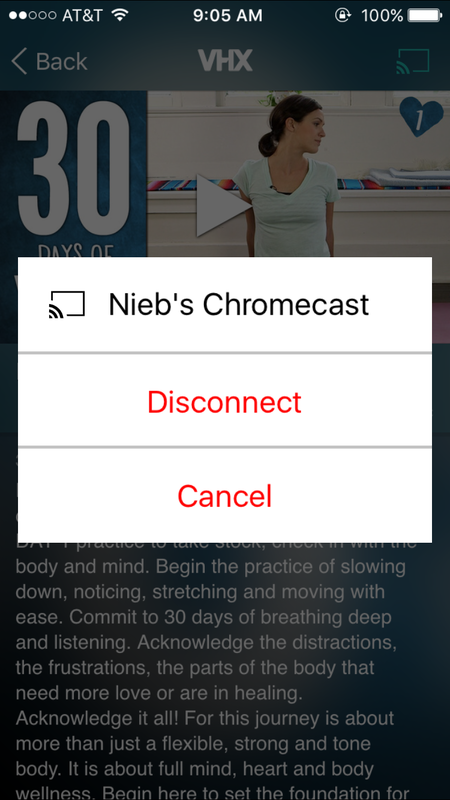 Tap the Chromecast button in the upper right of the app. 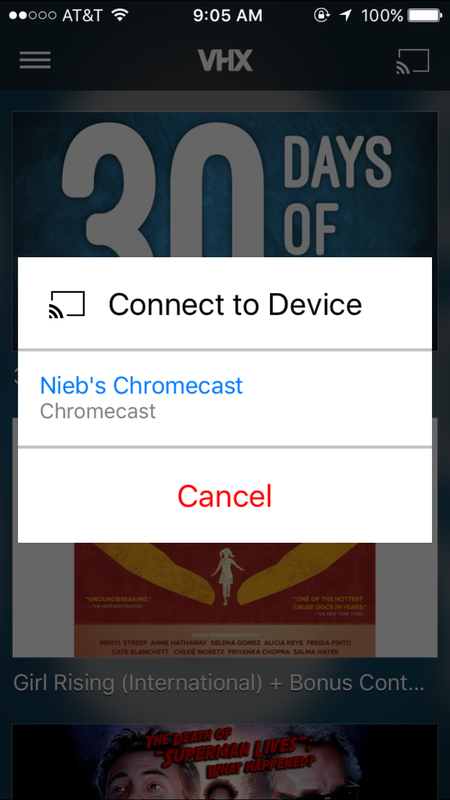 Tap the Chromecast device you wish to connect to. You can then navigate to a video to watch. 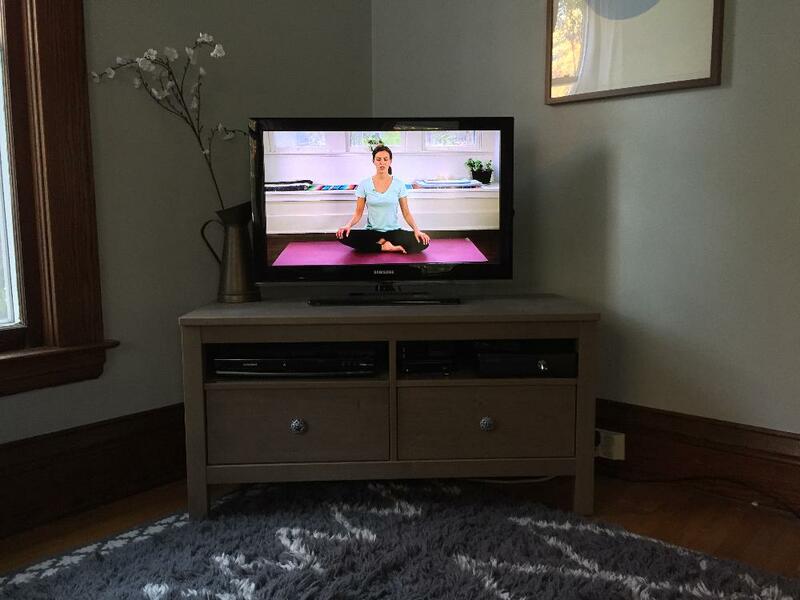 Tap a video to start watching it on your TV via Chromecast. To disconnect from your Chromecast, click the Chromecast button, then Disconnect. With the VHX Roku channel, you can stream all of your purchased VHX content right in your living room. Install the VHX channel on your Roku. 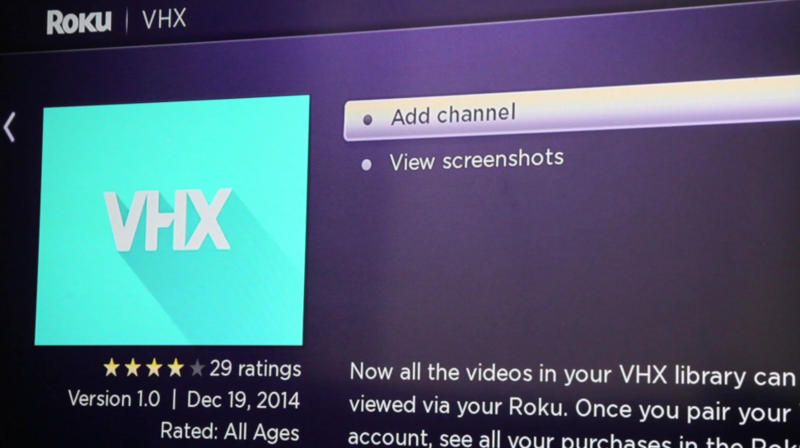 On your Roku, in the channel store, search for "VHX" and hit Add channel. 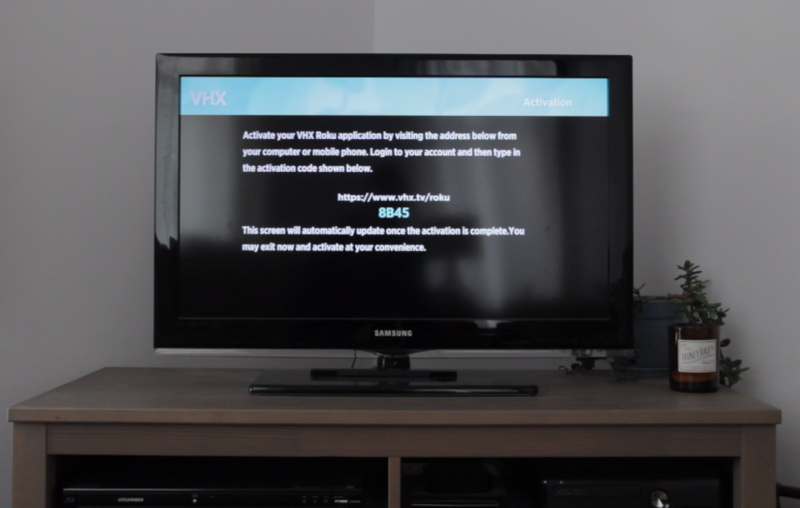 OR, on a computer or mobile device, add the VHX channel to your Roku account here. Once the channel's been added to your Roku, launch the channel to start the activation process. An activation code will appear on screen. 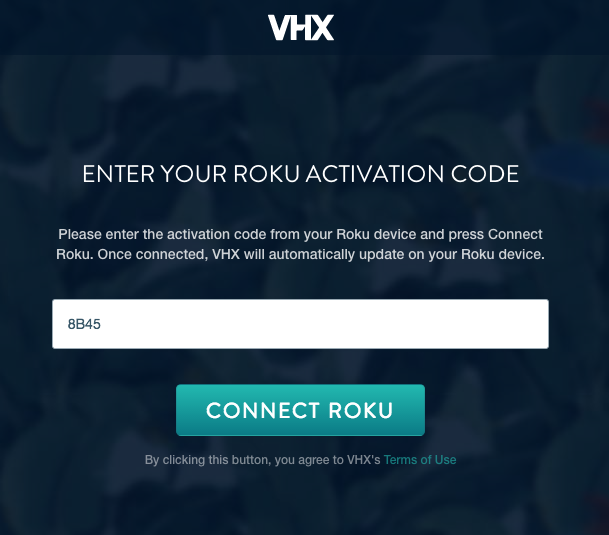 Go to http://vhx.tv/roku and click on the button, Activate your Roku. You will be taken to the activation page at https://www.vhx.tv/activate/roku. Enter the code you received from step 1.3 above and click Connect Roku. 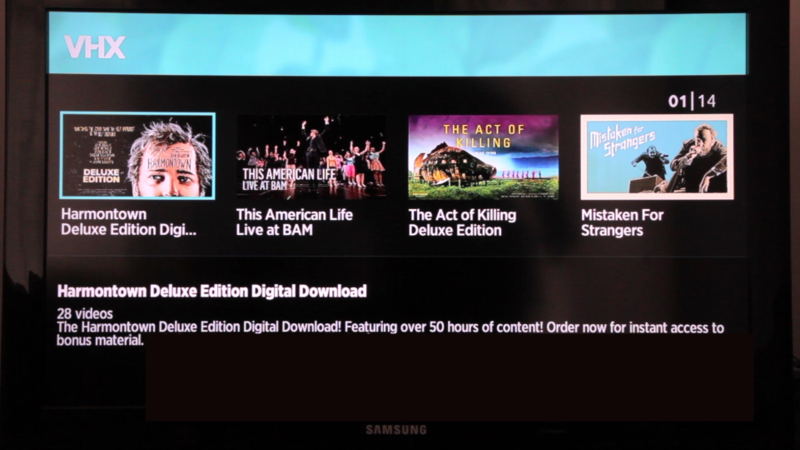 Once activated, your entire VHX purchase library will load on your Roku. 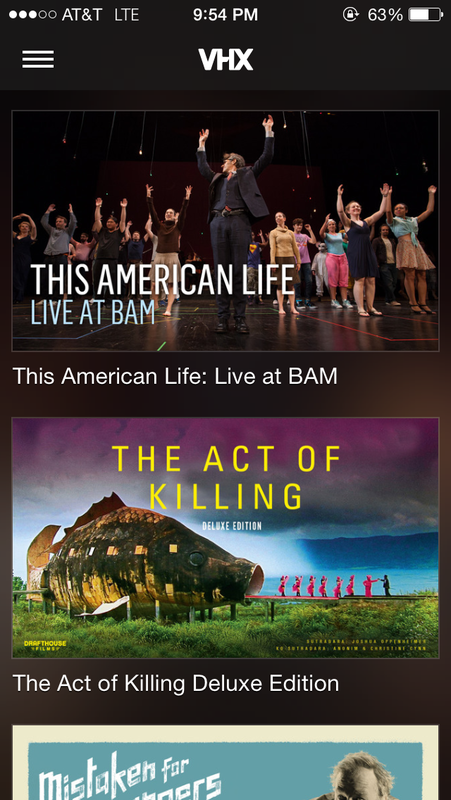 Use your Roku remote to select and watch. Enjoy! To watch with subtitles on your Roku, push the * button on your Roku remote and select the language of your choice. Subtitles are only available on videos that have subtitles. Head to the watch page of the VHX video you want. Scroll down to the Video Downloads button, choose which size you wish to download, and download the file to your computer. Transfer the downloaded video file from your computer to a USB thumb-drive or hard drive. Plug that drive into the USB port on your Blu-ray/DVD player. Browse the drive from your Blu-ray/DVD player menu to select and play the video. Scroll to the downloads button, choose which size you wish to download, and download the file to your computer. Plug that drive into the USB port on your TV. 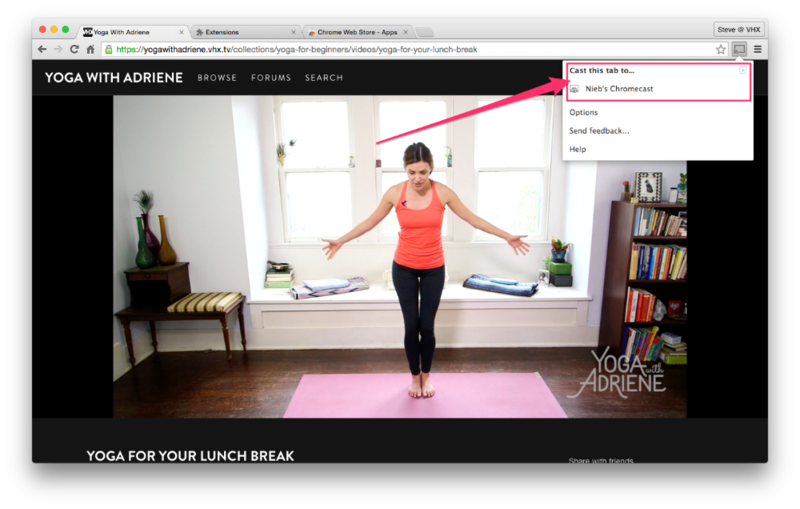 Browse the drive from your TV menu to select and play the video. Once you have downloaded the video to your computer, there a few different ways to get it playing on your Xbox 360. Find a flash drive that is large enough for the video file to fit on, and transfer the file to the Flash drive. Plug the drive in an empty USB port on the Xbox and navigate to the “TV & Movies” section. You can then select the storage device (your flash drive) and play right from there. WINDOWS PC: Xbox and Windows make it really easy to stream right from Windows Media Center to the Xbox console. Check out their simple instructions here. Select the folder with the downloaded video and share it with your Xbox 360. Locate the video and hit PLAY. It’s so easy! Find a USB flash drive that is large enough for the video file to fit on, and transfer the file to the drive. Plug the drive in one of the empty USB ports on your PS4 and navigate to the “Media Player” section. You can then select the storage device (your flash drive) and play right from there or transfer the file to your PS4’s internal hard drive. Select the folder with the downloaded video and share it with your PS4. The folder will appear under PS4’s media player as “Plex Media Server”.